... but here they are! Creative Passage took these old spools and made them adorable photo holders! Brilliant! Binkies and Briefcases went from ugly dresser to gorgeous kitchen island! Modern Country Style took an old cardigan and made a super cute throw pillow! Junk Blossoms made over this chair. I LOVE the fabric she chose! The Frosted Gardener made over a dresser! I LOVE the drawer pulls that she chose for the dresser! Adorable! 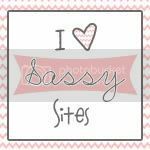 Was your trash featured at Sassy Sites? Thanks for hosting again. 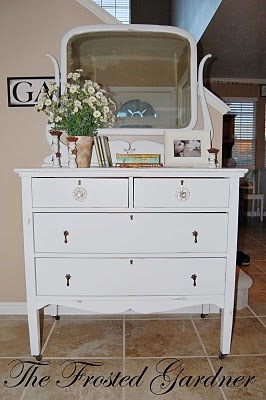 I love that chair and dresser. Wow, thanks so much for featuring my spool photo holders! I am honored! Thanks for hosting such a great linky party! Thank you so much for featuring my chair makeover. Can't wait to see the entries for this week. Thank you for hosting this wonderful party! !